Welcome ! STarKos is a new tool for any CPC with 128kb ! STarKos is a sountrakker, like BSC's one or AMC. Of course, it was designed to be much more. You'll find the new features at the end of this text file. Most files haven't been modified since the improvments concern the interface mostly. STarKos is FREEWARE. You can freely copy and spread it around the world. However, feedback, comments, ideas, bug reports or donations are welcome. STarKos IS supported by its author. Bugs will be corrected, and I intend to release enhanced versions later. STarKos help files are ENTIRELY translated in english AND in french, but the tool remains in english. Everything was made to be understandable, but don't hesitate to ask me for any more help. Please do not modify any of the files on the original disk. When spreading the disc, please SPREAD ALL THE FILES ! STK. The main STarKos file. GS. Generate the STarKos SKS files into BIN file, usable in your own productions ! GP. Generate the player for you to play any STarKos song in assembler or Basic. PLAY. Little prog to play any non-digidrum STarKos song. DIGIDRUM. 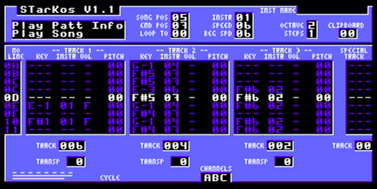 A example song using digidrums. STARK2YM. Convert any STarKos into YM file. RELPLAY.BIN Player Relocator, compiled in #9000. RELSONG.BIN Song Relocator, compiled in #A000. DIGIDRUM.DAM Sources for digidrum managment. PLAYASM9.BIN Assembler/Basic/Interruption players assembled in #9000. PLAYBAS9.BIN You can use them but do not modify them ! STARK2YM.BIN Binary files for the modules. Useless to you. STK11-1.ROM Two roms for your RAMCARD, including STarKos 1.1. STKGENS.ROM One more rom including the generators. AKSDIGI.SKS/BIN or compiled version (BIN) to use with the external player. BDLXS.SPL 8 bits samples for the DIGIDRUM demo. README.ENG / LISEZMOI.FRA This file. KEYS.ENG/FRA Hotkeys list for the editor. PLAYERS.ENG/FRA Technical info about the players. RELOC.ENG/FRA How to relocate your players and songs. STK11.ENG/FRA Editor notice. Important ! YM.ENG/FRA How to use the STarKos to YM converter. Please do not spread your disc if any of these are missing ! Note that the music that come along with this kit are, for most of them, beginnings of adaptation of ST songs. Why just beginnings ? Simply because they're already available in YM ! In order to save some time, I made only beginnings, to show what STarKos was capable of. Note finally that differences exist between my conversions and the original versions. However, the result sound quite alike ; I didn't have the music sources in my possession. Starkos 1.1 main improvment is the pattern scrolling while playing the song ! Two bugs were corrected in the external player, including the one with the RST bad behaviour. IT IS IMPORTANT to use the new players, and not the old ones. Note that they have all exactly the same size and take the same machine time as before. - Also, thanks to Sice from Dirty Minds, I corrected a bug in the digidrum kit. Some sounds weren't correctly retriggered after a digidrum. Thanks Sice ! - A strange (but harmless) thing could happen very rarely in the GET DIR option. - When converting your song, a very rare case could encode badly the last HEIGHT value. - ENTER in the Pattern Editor captures the number of the instrument pointed by the cursor, to set the current instrument. Very handy while composing ! - In the Linker and Instrument Editor, modifying a value set the END too. So you don't have to do it yourself ! - Inserting/deleting a value does the same. - DEL in the Instr Editor set the current value to 0. Shift+Del set the whole line to 0. - In the Linker or Instr Editor, Shift+Control+down makes the cursor go to the END of the list (goto END). - Changing the current position (F7/F4) doesn't force the cursor to go to line 0. - COPY in the Instr editor copies the current value to the next line. Useful ! - The Shift+Control step when modifying the Arp value is now an octave. Handy. IMPORTANT : I had to remove the Copy/Cut/Paste 3 Tracks feature, because the buffer it used took too much memory. On top of that this buffer was overflowing on some others !! I hope no one will be annoyed by this. Last remark : The SKI files are now of side 2. If was done to avoid using 187ko format on side 1, which can prevent people from extracting files from the DSK. Please remember : FEEDBACK is VITAL for coders ! Do NOT hesitate to write ! Thank you for your attention. I really hope STarKos will improve your creativity and that great songs will be made off it.